RasterEdge DocImage SDK for .NET provides professional and accurate Codabar generating component to quickly and easily write Codabar on images and documents, including image formats GIF, BMP, PNG, JPEG, and PDF, (Multi-page) TIFF, and Microsoft Office Word, Excel and PowerPoint documents. As long as you are using .NET 2.0 or above, and you have installed Visual Studio 2005 or later, you can easily draw and add readable Codabar in Visual C# Class Library, ASP.NET web and Windows applications. You can easily generator Codabar barcode and save it to image files/object using this C#.NET barcode generator control. 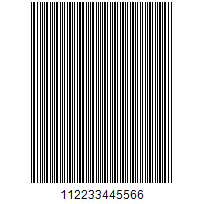 The following steps will show how to create a Codabar type barcode encoding numeric data text "112233445566" into the image object with XImage.Barcode.Creator. Please copy the sample code as follow to generator a Codabar barcode. The following C# sample code will guide you to create a linear Codabar on a local png image demo. Other supported image formats include BMP, PNG, GIF and JPEG. Besides you can also customize barcode location on images by changing the horizontal & vertical coordinates. To adjust barcode dimensions and other settings, please view details in the property table of last section. With RasterEdge.Imaging.Barcode.Creator.dll and RasterEdge.Imaging.Basic.dll, developers can create Codabar on the certain documents page and area, including PDF, (Multi-Page) TIFF, and MS Word(.docx), Excel and PowerPoint documents. For all the above properties, we have demonstrated here the complete Visual C# sample codes. Developer can simply copy to your .NET program to print Codabar on your target images or documents.